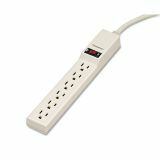 Fellowes Six-Outlet Power Strip, 120V, 4ft Cord, 10 7/8 x 1 7/8 x 1 5/8, Platinum - Six-outlet power strip features a three-prong grounded plug and three-prong outlets. Power strip also offers an illuminated on/off switch with 15-amp circuit breaker. UL and cUL approved.